What is low stress training? It’s the practice of gently bending stems and tying them in place to drastically change the shape of the plant. This is done to get the heaviest fruits possible in the least amount of square footage available, even out the canopy, and overall help you use light more efficiently. It is commonly used on bonsais. The process begins when the plant is only a few weeks old and will continue all the way through flowering in order to give it the best chance to flourish in an area that may be less than vertically or horizontally ideal. As each node grows it will be tied down to a portion of the pot, watering system, or surrounding wall to give it an anchor. This anchor then guides the plant on its growth path, in order to effectively use as little space as possible. By tying down the young stem enough to bend it, you will encourage growth towards that direction. Using pipe cleaners, fish hooks attached to adjustable strings is the most used method because it is harmless to the plant. Anytime you use string or something less flexible than rubber bands, keep in mind that the tie-down area is going to grow a lot over a short span, and anything which constricts the flow of water along that pipeline is going to affect the overall health of that site for the rest of the grow cycle. The stems you bend over with LST can be tied to the pots your plants are in, your hydroponics bucket, a tomato cage or most anything you can think of. Make sure that you can pick up your plant as one unit. Don’t anchor any part of your plant to the floor or it will be difficult to move your plant. Zip ties have also become more common because they provide a quickly adjustable method to tie down branches which can sustain a low level of constriction with a high capacity for strength. Because you can still hold the growths with enough space to grow into, this makes for a low-maintenance choice which can relieve many of the headaches involved with using LST in your garden. Generally, the straight-line nature of their build means you won’t have as many directional or customization options when the moment comes to decide what your plant is going to do, but for an easy-to-use application, these are definitely the best way to go. If you accidentally hurt the plant, and you create an open wound, it’s important to tape up the wound to keep it closed while also providing support to the stem. The tape acts like a bandage and cast until your plant has healed. 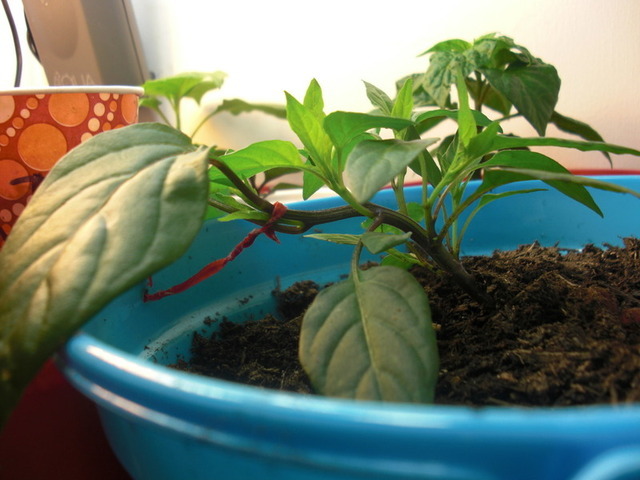 After initially bending your plant, it’s possible growth may slow down for a day or two as the plant recovers, especially if stems are damaged in the process. But usually, with LST there’s little to no recovery time and the plant gets right back to business as usual. Often times they’ll be pointing back up at the light in just a few hours. Most plants can get pretty strong when they get bigger, and a strong grip will be required to keep everything tied in place. Eventually the branches will outgrow most bonds you originally make. But by the time this happens, they will be able to support themselves without your tethers. Always plan ahead of time which direction you plan on taking your plant so you don’t lose track of your direction. Making a drawn diagram is an easy way of keeping thing uniform. One thing to remember, bent stems immediately “realize” they’re sideways, and any part that is not tied down will immediately start growing upwards again. The unbound parts of a healthy plant will point up again in just a few hours. Buckets, no matter if they are using clay pebbles or Complete Hydroponics Coco Coir or just soil to keep your roots grounded, you should follow a few key rules when deciding how your plants are going to eventually pan out. The biggest mistake beginners make is to only make anchoring holes along the edge of the bucket, using only those to secure any wild branches will leave you with an uncentered bush that has a huge bald spot right in the middle, with no flowers or fruits basking in the most important portion of the grow. This can be harmful for both hydroponics and soil, as the central root area is the last place you want being heated up over its limits, and without proper coverage, it can bake a healthy root system alive just a matter of days. To avoid this, make sure you tie down the first growths out to the rim, and after one link double back into the middle in order to give the surface of your medium the protection and shade it needs to keep root masses cool. When LST your plant, it’s important to keep your plant well nurised so it has the energy to recover and to keep growing. Nutrients like Complete Hydroponics are easy to use and will give you plant the boost they need to keep performing as desired. Only bend soft growth – Newer growth is soft and pliable, so it is easily bent to your will. It’s important to focus on bending the newer, most flexible parts of the plant to avoid breakage. If a stem feels stiff, it will likely break if you try to bend it. Start Training Early – Start low stress training early in the plant life so you can avoid ever having to try to bend thick stems. If you keep on top of plant training from the beginning, you will only ever need to bend new growth and it will go much more easily. Make Sure Ties Are Securely Attached to Plant – Don’t let wires or ties “scrape” or slip across the surface of a stem because it can cause abrasion (imagine something rubbing all over your skin until it gets raw). If you’re having difficulty getting a specific stem to stay down without slipping, try to secure that stem in more places so all the stress isn’t being placed on just one part of the stem.